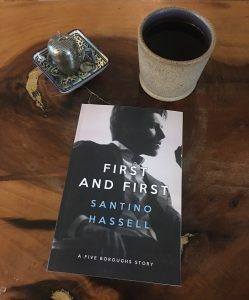 I purchased a copy of Santino Hassell‘s First and First from the publisher, Dreamspinner. Caleb Stone was raised on the Upper East Side, where wealth and lineage reigns, and “alternative lifestyles” are hidden. It took him years to come out to his family, but he’s still stuck in the stranglehold of their expectations. Caleb knows he has to build his confidence and shake things up, but he doesn’t know how… until Oliver Buckley enters the picture. Oli is everything Caleb isn’t—risk-taking, provocative, and fiercely independent. Disowned by his family, Oli has made his own way in the world and is beholden to no one. After a chance encounter on New Year’s Eve, Caleb is smitten. I have to admit this wasn’t my favorite of the series. That isn’t to say I didn’t like it, of course I did. I seem to like everything Hassell writes. But this one didn’t resonate with me as well as the others did. Maybe because it moved away from the blue collar crowd I loved so much. Let me be clear, I loved Oli and Caleb and, as always, I love Hassell’s prose. But this one felt a little off to me. But off in a way I seem to always find with Hassell’s books. I so often can see the framing in the books or the pointed messages he writes his books around. Even when I agree with them, I’m usually put off by their being so obvious. I noticed a number of recent (to the time of writing) internet dramas leaking into the book, condom policing, heteronormative and monogamous expectations and such. And while I like seeing authors thumb their nose at such things, I had a couple issues here. First, I suppose if I hadn’t seen the GR debate about prophylactic politics in reviews of Hassell’s earlier book, I wouldn’t be bothered to see the f’ you to the condom police here. But as it is, I did and I had to wonder if this wasn’t a more pointed slight. Do I agree there is a problematic relationship between female readers and expectations condom usage in m/m novels as opposed to m/f novels? Hell yes, and I respect to Hassell for taking it on. But I also don’t want to imagine one of my favorite authors flipping off his readers. Maybe I’m wrong. I sure hope so. Second, I loved that this book presented viable non-heteronormative and non-monogomous relationships. But given that the whole book did just that and gave us one partner who was not initially interested in monogamy and another who seemed interested in exploring group play at least a little, I thought that the ending was a bit of a cop out. Like Hassell wrote the whole book intending to give Oli and Caleb a HEA much like Aiden and Jace’s, but then had to bow to the expectations of the romance readership. I’m not saying that’s what happened. How would I know? But that’s how it felt to me. Personally, I thought the ending both rushed and not true to the characters as they’d been written to that point. Again, I liked the book. I’ve already read the 4th one and plan to read the 5th one. Hassell writes wonderfully and his characters are always wonderfully fleshed out. But this one didn’t light me up like some of his other books. What I’m drinking: Wuyi Olong, which is described by Traveling Tea, where I got it, as a “Dark amber liquor with notes of raisin and honeysuckle.” I don’t know about that, but it’s pretty good. This entry was posted in books/book review and tagged #DiverseRomanceBingo, #ReadDiverse2017, book review, M/M, romance on April 30, 2017 by Sadie. 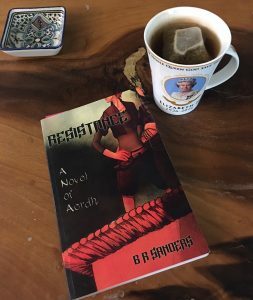 I bought a copy of B. R. Sanders‘ Resistance. Resistance has many faces, and one of them is Shandolin’s. When she finds her friend brutally murdered, Shandolin decides to fight instead of run–but her only hope of survival is a takeover of the City government. Shandolin draws everyone she loves into the fray with her: her assassin lover, Rivna; her mentor, Moshel; and her best friend, Kel. Apart, they are weak, but together Shandolin and her friends, lovers and fellows may be just strong enough to save their skins and the skins of the other elves in the City. Another winner from Sanders. The world-building here is fabulous. Though I’ve read several stories in this world, I think you get a pretty good idea of its complexity here in condensed form. The main character Shandolin (Doe) is likable as are the side characters. But what’s really great is that you get diversity in the cast, both in the racial divisions of the elves, Qin, satyrs, humans, etc (though not all of them play a big part in this book), but also in sexuality, gender orientation, body types, and relationship styles. And all of it is just part of who they are, no need to make it the conflict on which the story hinges. The infant social revolt that the story does hinge on is sketched out fairly faintly. Much of it depends on connections Doe made before the beginning of the story. But there is certainly enough to follow and believe it. I did feel the end was a bit rushed. Though I liked the ending just fine, it did seem to come about quite easily. As an aside, and I’m really not sure as it’s been over a year since I read Ariah, but I think some of these might be side characters from the middle of that book. I’m not sure, as I said, but they all felt so familiar but I’m not certain on the names. Can anyone give me a yes or no on that idea? I see another review that said this is a whole new cast. So, now I’m doubting myself. This entry was posted in books/book review and tagged #DiverseRomanceBingo, #ReadDiverse2017, book review, f/f, fantasy on April 28, 2017 by Sadie. 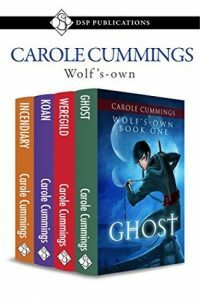 I purchased a copy of Carole Cummings‘ Wolf’s-Own bundle, containing Ghost, Weregild, Koan, Incendiary. I’m not going to write individual reviews for each of these books, because though I understand they are split up to avoid a 900 page epic and each does come to a relatively natural stopping point, it is undeniably one single story and any individual book would be most unsatisfactory on its own. So, they are not stand-alones! But since I read them as a bundle I’ll rate/review them as one. Even as I acknowledge that if I’d only had the first, I likely wouldn’t rate it so high, considering its lack of conclusion. But as a single story I really enjoyed it. It’s tragic and complex and redemptive all at the same time. I loved Fen and Kamen, as well as Kamen’s whole team and Fen’s family. The world is complex and multi-demential and the peoples are varied. I did occasionally, especially in climactic scenes, wonder how things that happened happened. I often knew what was happening, but felt I missed the explanation of how it was happening. How someone suddenly had control of another or caused a certain something to occur, etc. Similarly, sometimes things that were meant to be cryptic to the characters were also a little too cryptic to the reader. But all in all I loved it. This entry was posted in books/book review and tagged #DiverseRomanceBingo, #ReadDiverse2017, book review, fantasy, M/M, romance on April 27, 2017 by Sadie.